Do I Need Winter Tires when driving in Calgary? Honda West | Articles | Do I need Winter Tires in Calgary? Winter vs. All-Season vs. Summer Tires. Which one is right for you? With Alberta’s frequency of snow and winter conditions, suitable tires are conducive to your safety and ability to drive without delays. But are All-Season or Summer tires the best choice for year-round driving in Alberta? Let’s dive into the basics of each type of tire and their usefulness in all conditions, as well as the benefits of each. Regardless of the brand, winter tires are all designed with many of the same elements in mind. Compared to all-season tires, the rubber compound is much softer and stickier. As a result, the tire is able to deform and grip the snow and ice much better. The tread is also designed in a way that the pattern is able to evacuate slush, snow and water and keep you on the road and avoid losing control. Additionally, the tiny horizontal patterns on the surface of the tread assist in retaining traction during icy conditions. Because of the soft compound of winter tires, they may wear faster and will not be as precise on dry pavement in comparison to an all-season tire. 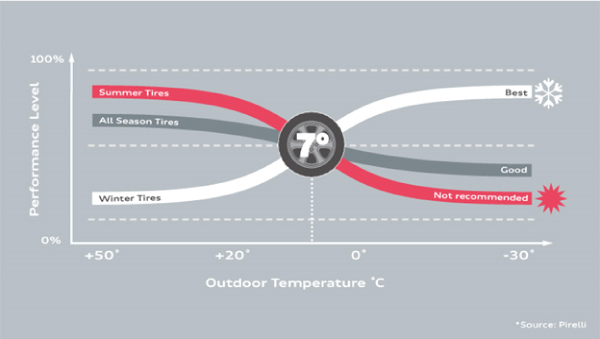 The term “All-season” suggests that the tire will be capable in summer and winter conditions. All-season tires are designed to be a practical compromise between summer and winter tires. You may find that, while they are sufficient, they will not perform as well as winter tires in snowy conditions, and will not perform as well as summer tires in dry conditions. This is because they have less spacing between the tread to ensure that noise and harshness are minimized. Also, the compound is neither as hard as summer tires nor as soft as winter tires, so they will perform adequately in all conditions. Are designed for optimal performance at temperatures above 7 °C. These tires typically use a soft rubber composite that delivers good grip and handling on both dry and wet roads. However, this same composite makes summer tires less suitable in winter weather conditions below 7 °C. Choose a summer tire if you have a high performance vehicle. They offer increased receptiveness, cornering, and braking capabilities due to specialized tread patterns and rubber compounds that allow for improved precision on the road. The tread compounds of summer tires are designed to remain more elastic, allowing for better traction and grip. Summer tires may have thinner tread depths that allow for more stability when pushed closer to their limits. So which type of tire is right for you? The graph below may assist you in reaching an informed decision. Additionally, It is worth researching the cost of owning and replacing a set of winter tires, and determining if a second set of tires is within your budget. Honda Dealer’s in addition to offering the Lowest Price Guarantee on tires; offer winter tire and wheel packages that are designed specifically for your car and offer discounts on those packages at the time of purchase. Additionally, they may offer a multi-season tire storage service, in which they will store your tires for you every season for a nominal fee of, so tire storage while living in an apartment should not be a concern. NEED A NEW SET OF WINTER TIRES?